A US team has won a $50,000 (£25,000) competition to design a spacecraft to rendezvous with and track the path of an asteroid which may threaten Earth. The winning entry, led by SpaceWorks Engineering, will shadow asteroid Apophis for 300 days. The measurements it takes will be used to refine what is known about the orbit of this 300m-wide space rock. Apophis will make a close pass of Earth in 2029 and there is a small but real possibility it could hit in 2036. The competition was organised by the Planetary Society, a space advocacy group with its headquarters in Pasadena, California. The idea behind the project was to "tag" Apophis and thereby plot its orbit accurately enough to determine whether it will strike our planet. The contestants were tasked with designing a mission which would launch, rendezvous and collect enough data in time for governments to decide in 2017 whether or not to mount a mission to deflect the asteroid off its current course. "We hope the winning entries will catalyse the world's space agencies to move ahead with designs and missions to protect Earth from potentially dangerous asteroids and comets," said the Planetary Society's director of projects, Bruce Betts. On whether space agencies were doing enough to counter the threat posed by near-Earth asteroids, Mr Betts said: "There is a sense that generally with space agencies there is not enough being done. Obviously space agencies have a lot on their plate - a lot of things to choose from. "But in this case, we're talking about the one truly preventable natural disaster." The Foresight spacecraft, designed by Atlanta-based SpaceWorks Engineering, will rendezvous with Apophis and determine its centre of mass. 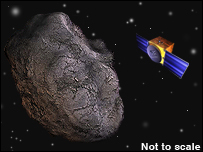 The probe will then take regular measurements of its position relative to the asteroid. These measurements will be used to reduce the uncertainties in Apophis' orbit. "Apophis isn't science fiction, it isn't a blockbuster Hollywood movie; it is very real," said Dan Geraci, the Planetary Society's board chairman. "And it's going to test our ability to keep a long-term focus on something because of the time between now and 2017, 2029 and 2036... this is a chance to use it as an example of how best to prepare and build a plan." Those behind the winning design say they hope to launch the craft in 2012. At the moment, however, the mission exists only on paper. Second place in the design competition was taken by a team led by Deimos Space of Madrid, Spain. Third place went to a group from EADS Astrium in Stevenage, UK. The Georgia Institute of Technology, based in Atlanta, took first place in the student category, winning $5,000 for their design. Asteroid 99942 Apophis is a primordial relic from the formation of our Solar System. It is thought to be made largely of rock and circles the Sun in an orbit that brings it close to our planet. In 2029, it will approach the Earth within a distance closer than a geostationary satellite - and near enough to be seen with the naked eye. If the orbiting behemoth passes through a "keyhole" in space measuring several hundred kilometres wide during this pass, it will strike Earth in 2036. Earth-based observations might not be sufficient to rule out an impact in 2036. Planetary defence advocates say it is imperative to collect data on the asteroid's path as soon as possible to know whether it will strike our planet or not. If it is found to be on a collision course, one option governments have is to mount a deflection mission. This would involve launching a spacecraft able to give the asteroid a nudge to change its orbit. Leaving this too long would make it impossible to build a spacecraft powerful enough to move the space rock out of harm's way. Ideally, say advocates of such a mission, Apophis' orbit would need to be changed before 2025 to be sure it misses the Earth. Nasa estimates that if Apophis were to hit Earth, it would explode with as much energy as 400 megatonnes of TNT.